Group rates are available; advanced reservations are required. Ask about any additional discounts! Audio Tour – Available to those with Sight Disabilities for FREE! All others can rent Audio Tour for $3.00. Written Tour – Available to those with Hearing Disabilities for FREE! All others can rent the Reading Tour for $3.00. 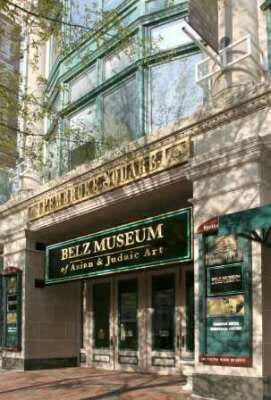 The Belz Museum of Asian and Judaic Art is located at 119 South Main Street in the Pembroke Square Building, at the intersection of Gayoso Avenue and South Main Street. The museum is just one block west of the Peabody Hotel and is accessible from the Main Street Trolley line. Within walking distance of great shopping, dining, and Memphis’ own Beale Street, the museum is in the heart of Downtown Memphis. 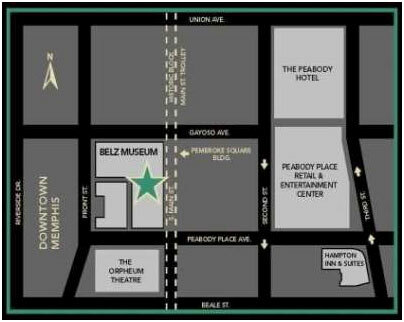 Garage, Lot, and Metered parking for the Belz Museum is available along Peabody Place. The Tower Garage, located at 110 Peabody Place Avenue, is the closest garage and provides discounted parking. The garage entrance is on Peabody Place between 2nd and Main Street. Bring your ticket to the Belz Museum of validation. NOTE: If there are big events going on downtown, the garage charges a flat rate. We apologize, and in this situation, we cannot offer discounted parking. FROM MIDTOWN / I-240: Driving on Poplar/Madison/Union Avenue towards downtown, turn left onto Second Street. Follow to Peabody Place. Turn right. FROM ARKANSAS / I-40 EAST: Take Exit #1 for Front Street/Riverside Drive, heading towards Front Street. Travel south on Front Street and turn left onto Peabody Place. FROM I-40 WEST: Take Exit #1A for Second Street; Travel south on Second Street and turn right onto Peabody Place. FROM I-55 NORTH/SOUTH: Follow the exit for Riverside Drive. Travel north along Riverside Drive and take a right on Beale Street. Take an immediate left onto Front Street then an immediate right onto Peabody Place. Adult and student group tours are available Tues. – Fri. 1030 a.m.-4 p.m. Reservations required. Special rates are available for groups of 10 or more. For detailed information regarding student tours, please visit our Education Page. Docent guided tours are available to the public with reservations; Please call ahead to guarantee staffing. The Emperor’s Lunch is designed for 10-80 people, seated in the Dynasty Banquet Room. Reservations should be made no later than one week before desired date. Call or email the museum for a Reservation Packet with menu options. Photography is permitted in the galleries. Movie and video cameras are prohibited in all galleries. For press and other special photography, including filming and videotape projects, please contact the museum. Belz Museum reserves the right, at its sole discretion, to withhold and/or withdraw permission to photograph on its premises or to reproduce photographs of objects in its collection.